April 25th is ANZAC Day in Australia. ANZAC (Australian and New Zealand Army Corp) Day is a public holiday to commemorate the soldiers who fought at Gallipoli during World War I. The battle of Gallipoli is regarded as being of great significance by the Australians. It is interesting because also during the First World War, the battle of Vimy Ridge is of equal historic importance to Canada. Both battles are considered to be the moment when each country recognized itself as being unified as a nation; where men from across the country came together and fought as a cohesive unit. The image of national unity and achievement is what made each of these battles so important for each country. Australia elected to make ANZAC Day a national holiday, whereas sadly, Canada does not publicly recognize their historic coming of age event. Making the most of this long weekend, we took the opportunity to visit Ayers Rock. This holiday trip left us with mixed emotions. We find it difficult to express these emotions in a logical manner. Hence this blog entry is a bit disjointed, but we hope by the end of it you will understand our feelings with respect to this long weekend trip. Prior to arriving in Australia there were three things on our “Bucket List” that we wanted to see and do while in Australia. We wanted to (i) see the Sydney Opera House and Harbour, (ii) visit Ayers Rock and (iii) go to the Great Barrier Reef. 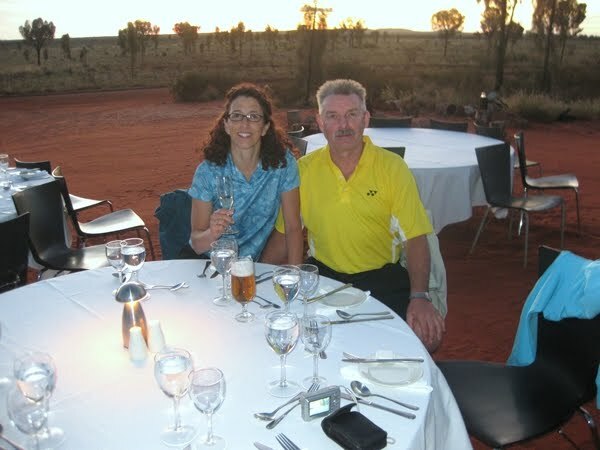 As you can imagine, going to Ayers Rock was high on our list of places to visit. 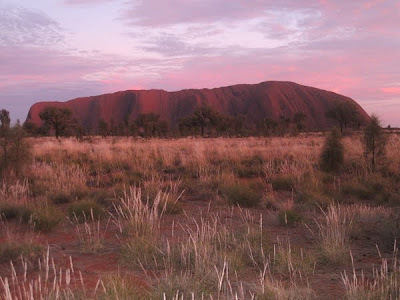 Once we arrived in Australia, the reality of getting to Ayers Rock started to crystallize. Ayers Rock is in the Outback, in the middle of nowhere, in the middle of the continent. Getting there by road is at least a three day drive (one way) from Adelaide. You can get there in two days, but the driving is hard and the days are long! 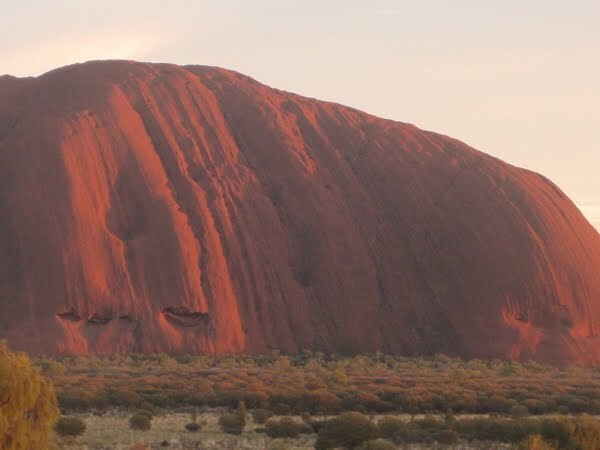 Given that our time is short in Australia and we only have 52 weekends, we decided that driving to the “ROCK” was out of the question as it would entirely consume one of our school term holidays. When we investigated our options with respect to flying, we soon learned that QANTAS has a captive market. QANTAS stands for “Queensland and Northern Territory Air Service”. We surmise that QANTAS must have built the airstrip at Ayers Rock and thus can charge whatever the market will bear. Hence, seat sales to the Rock are few and far between and when there are sales, you wonder if the seats were ever put on sale because the prices are still outrageous. Once we started to look at accommodations at Ayers Rock, we soon concluded that the weekend would cost a small fortune. Our Australian friends had advised us that we shouldn’t get too excited about visiting it, because after all, “it is only a rock”. Given the cost, we concluded that for the same amount of money we could enjoy a nice week or two in Bali or some other place. Unhappily, we were virtually at the point of electing not to visit this Australian icon. Finally, we asked ourselves, if we don’t go, will this be something that we regret once we were back in Canada? After considerable deliberation, we decided to bite the bullet, tell ourselves that we only live once, Ayers Rock was on our bucket list and that we should “GO FOR IT”! As noted above, Ayers Rock is in the Outback, in the middle of nowhere, in the middle of the continent. 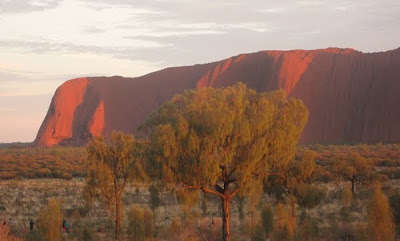 Are you beginning to get the image that Ayers Rock is a long ways from anywhere? One of our travel books suggests that if you want to see the outback, all you have to do is drive “Out” for one hour and then drive “Back”. You will have seen all you need to see of the outback during this two hour drive, because the outback is a sea of endless desert and arid vegetation. This slightly humorous description of the outback really does not pay it justice. On both a macro and micro scale, there is a subtle beauty to the outback that you can’t help but appreciate. At a macro level, as you fly over the landscape, you see beautiful rock formations that originate from ranges of once tall mountains that have been eroded over millions of years. Scattered between these ranges are miles and miles of sand dunes that were once part of an immense inland sea. Interspersed is a vast network of dry channel river beds and lakes that only fill with water during intense storm events from tropical storms that have periodically strayed further south than their typical normal weather patterns permit. These landforms blend in colour between shades of white, brown, red and ochre. Added to this are hues of green and brown vegetation that struggle for survival in this arid environment. On a micro scale, as one walks through the outback, you can’t help but notice the blood red colour of the sand that fills your shoes as you step around the tuffs of grasses, shrubs and trees that cover the ground. It appears as if the vegetation has been selected and delicately placed so as to maximize and horde any and all available moisture. Prior to leaving for the Rock, a few of Gail’s teaching colleagues in Kadina remarked that they thought it rather outlandish, yet exotic, that she was flying half way across the continent for the long weekend. We hadn’t thought about it, but yes it would be the equivalent of flying from Edmonton to Toronto for a long weekend. This is certainly, something that we have never done and likely would not consider doing while residing in Canada. However, we only do have 52 weekends in Australia with 36 remaining. After hours of being in the air and flying over the endless outback, we finally saw the Rock. Ayers Rock, or Uluru as it is know by its aboriginal name, is a huge monolith, majestic in stature, protruding out of nowhere on a flat bed of unending level terrain. The view whether from the air or on foot, is spectacular and leaves one with a feeling of reverence. The size of the Rock is enormous; it doesn’t matter what time of day you view the rock, the shades of light from the sun give the rock a kaleidoscope of colour. Now we know and understand why it is one of the most visited places in Australia. As we disembarked from the plane, we observed a number of flights listed on the arrival and departure boards in the terminal that acknowledge planes coming from and going to virtually every major Australian city. 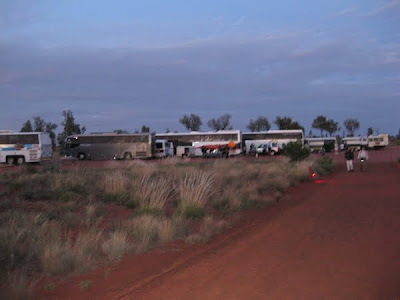 Passengers from all corners of the continent such as Perth, Sydney, Cairns, Alice Springs, Adelaide, Melbourne, Brisbane and Darwin were on a pilgrimage to Uluru. 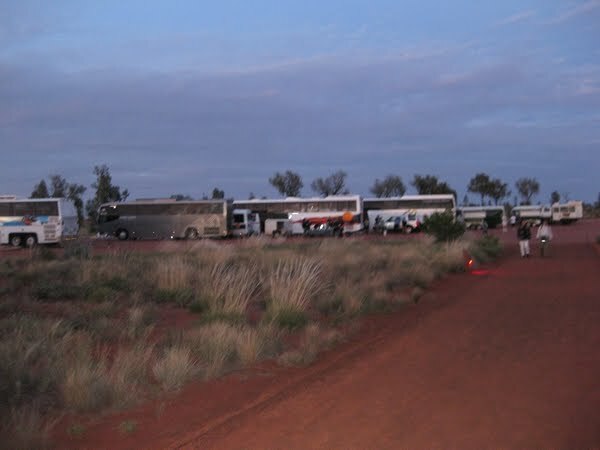 A bus was waiting at the airport to take us to the Ayers Rock resort. While en route to the resort, we discovered that we were essentially a captive market with no place else to go. There is no community at the Rock with the exception of an aboriginal community which houses somewhere around 100 residents. This community is off limits to the tourists and trespass is not permitted. 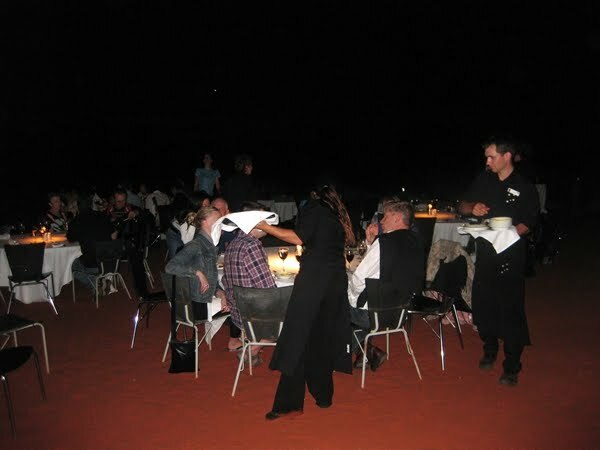 In fact, everyone working and living at Uluru who is not aboriginal is housed at the resort. The resort is comprised of four large hotels plus associated restaurants and bars, a caravan park, campground, a number of trinket shops, coffee shops, tour booths, a grocery store and an employee residence area. It seemed strange to discover that even the QANTAS employees working at the airport also lived at the resort. While at the rock we took a sunrise tour and an evening sunset – dinner under the stars tour. Both tours were stunning. However, we found it a little disconcerting that there was not one aboriginal person present to host or participate in the tours or work in the resort area. For example, even the person playing the didgeridoo which is an aboriginal musical instrument, was not of aboriginal origin. We also thought that it was a little inappropriate to listen to a Caucasian guide tell us about aboriginal folklore, while many of the aboriginals residing in the community are out of work and on relief. In North America when one visits a site of major First Nation’s significance there is typically a representative from the community who is present and proud to show off and explain First Nation’s culture to visitors. 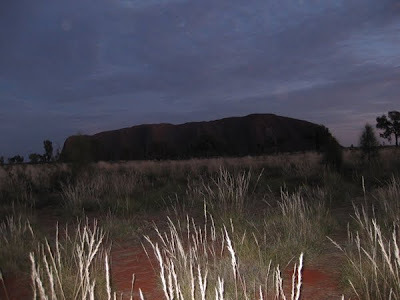 In this case, we are at a loss as to explain why aboriginals at Uluru were not doing the same. It is our understanding that the aboriginals, like our First Nations, are a proud people pleased to share their culture and heritage. When we asked around, we were provided with either no explanation, or that aboriginals didn’t have the education to run the businesses, or they were too lazy to work. We think that perhaps a more reasonable explanation may be that the aboriginals are just tired of the number of visitors coming to the area and want nothing to do with the tourists. Aboriginal issues in Australia are very similar to First Nation issues in Canada. This is not surprising as both countries have come from British rule and in the last one hundred years have both addressed aboriginal issues in the same dismal manner. We, as well as about a thousand other tourists, got up at 5:00 AM to watch the sun rise on the rock. If you are traveling this distance, you have to make the most of it and you are raring to go at the crack of dawn. As the sun rose, the rock transformed from a dark mass into a reddish hue of colour. As you can imagine, we have logged this sun rise into our memory bank! We had hoped to climb the Rock in the morning, but unfortunately the walk had been cancelled for the day. We were told that the walk is closed on four different occasions: (i) When temperatures soar above 36oC, (ii) When it is too windy and there is risk of people being blown off the rock, (iii) When it has been raining and there is risk of people sliding off the rock, and (iv) When there has been a death on the rock. In our particular circumstance, a hiker had died of a heart attack the day before while climbing the rock. The aboriginal council closed the hike for the following day to honour the memory of the deceased hiker. 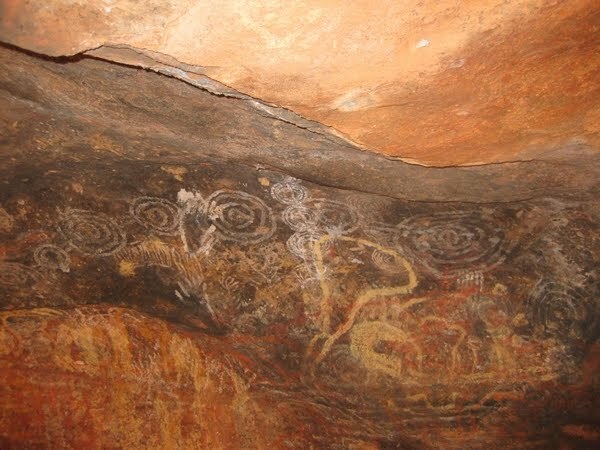 In lieu of the climb, we spent the rest of our time at the rock, walking around the base, going to the water hole and looking at aboriginal art that had been painted many generations ago on the rock. In the evening, we had a most memorable experience. 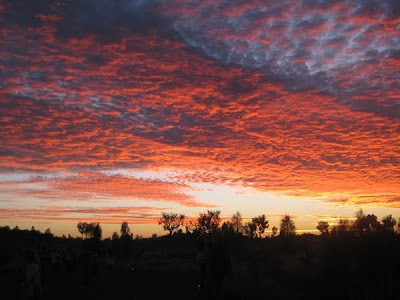 As we watched the sun set on the rock we sipped champagne along with about sixty other people who elected to dine under the stars in the desert. On a cloudless night we were pampered to a scrumptious meal of kangaroo, fish, chicken, and many other delectable delights as a musician played the didgeridoo in the background. Once it was dark, we were then entertained as an astronomer told us stories about the stars and constellations. We couldn’t believe the light that was reflected off the desert by the stars and moon. At our dining table there were seven people who had made their pilgrimage to the rock. We had come from Canada via Adelaide. Two couples, one from the United States and the other from Britain, had arrived by way of Melbourne. Our seventh person, who was from Spain, started his journey from Perth. The evening made us realize that Uluru truly was not only an Australian icon, but a global destination. Ayers Rock! You made it there - and I can imagine the mythical evening. Your photos of the rock are magnificent!